RECORDING WEEK: You could spend a lifetime reading about how to record audio, but most of us just want to get on and do it. If speed is of the essence, check out our 20 bite-size pieces of advice to get your vocal, instrument and other recordings sounding top-notch. 1. Always leave headroom on your input to allow for unexpected overshoots (extra loud snare hit, vocalist leans forward, etc.) - keep peaks below -6dBFS at least. Sacrificing a lift in the noise floor is a reasonable trade to prevent clipping that perfect vocal take. 2. Stereo or mono? Just because you can record something in stereo doesn't mean you should. Think about how you want it to be placed in the final mix and what the source requires. Does that acoustic guitar really need to be stereo when it's really just a rhythm part? 3. Commit if it sounds good. Don't worry about the technical details or what those know-it-alls online might think, just record it and move on. Fresh is best, even if it's a little rough around the edges. Experience is everything, so the faster you work the more experiences you get! 4. Don't use gear just because you've got it or want to try it out. This is particularly important with EQ and compression/limiting. If you're confident you want to commit them to tape or to disk then do so, but be sure they are providing the sound you want before you track through them, as you can't change it later. It's amazing how much separation you can get in a room just by changing the angle of a microphone. 5. Keep it short. The shorter the analogue signal path the better the fidelity, so use the shortest and best cables you have. Remove any devices that are not being used, even if they are bypassed, as every connection and ground connection is a potential noise source. 6. Keep it simple. Only use mics you will need and sound good together, don't add things just because the drummer gets excited by attention. As we've said before, you can't fix it in the mix, so if it sounds bad now it will sound bad forever. 7. Pre-production is key. Have as clear an idea of what you want as possible, even if that's just a role or atmospheric 'place' for what is to be recorded. If you want to experiment then dedicate time to do so with the understanding that this may well produce nothing (except fun!). 8. Get the source right first. Make sure the instrument sounds its best (in tune, warmed up, or awake/sober in the case of a vocalist) and sounds good in the room before moving any mics into place. Start with a single mic and check it sounds good before adding any others. 9. Don't spend ages auditioning mics, unless you have time before the performer(s) arrives, as you don't want to wear them out with your technical whims. In fact, try and remove the performer from all technicalities as much as possible; they're their for art, not science. 10. The distance between a mic and source has a defining effect on your recording. You may be tempted to get really close to cut back on the room sound or aid separation, but be aware of the proximity effect (low frequency increase as distance is reduced) as it can quickly make for a muddy, woolly tone. 11. Often DIY efforts are called for to reduce echoes, resonances and increase seperation. Packing blankets, duvets and carpet all make great absorbers, while dense, rigid objects (e.g. timber panels or flight cases) make great reflective separators. Listen, apply and then listen again. 12. Use the HPF or low cut on mics and preamps whenever the source lackslow frequencies. Extraneous noises like foot taps, distant road rumble, and nearby bass amps (!) will eat the headroom on the preamp and add mud to your recording. 13. Use the mic's polar patterns to your advantage, whether it's to screen out other sounds in the room or reflections off walls and windows. Look at the polar pattern data for your mic(s) to see which angles are the most/least sensitive. It's amazing how much separation you can get in a room just by changing the angle of a microphone. 14. Make sure you can always see the meters as you never know when something will need to be trimmed. They will also alert you to things you may have missed, such as a kick drum mic falling into the drum, a foot tapping on the mic stand or an electrical fault causing spurious noise. 15. Multiple microphone setups will always exhibit phase incoherencies, the challenge is to minimise them to achieve the most coherent and pleasing sound. Your ears are the best tool for identifying phase issues so use them as you add in mics. Use the phase (polarity) flip switch when auditioning mics to hear what frequencies are most affected. Decide on takes there and then. Don't leave these decisions until later if you can help it. 16. Monitoring is key. Whether it's headphones or speakers, the performer(s) must have the best and most flexible foldback you can achieve as the better they can hear the better they will perform. Obviously you need a good monitoring environment to get the best sound setup and hear any problems. 17. You will always set out to do more than you achieve, so be realistic and be prepared to adjust your expectations. Whether it's vocal overdubs or tracking a whole band be prepared to lose time to technical hiccups, toilet breaks, losses of confidence, etc. 18. Decide on takes there and then. Don't leave these decisions until later if you can help it. 19. Label everything you record. Use mic types in the track name if you want, make use of the marker tracks and track note pads in DAWs to keep notes of anything you may want to know later (alternate vocal takes, mic positions moved, etc.). Take photos of your setups too - they're often also useful for promo material. 20. Backup, backup, backup. Make sure you save your project files regularly and backup at the end of every session. When you leave the recording venue take a backup with you, or if you're taking it away make sure someone else has a copy. Recording Week is brought to you in association with Universal Audio. 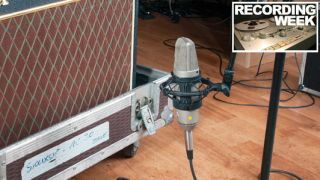 Check out the Recording Week hub page for more tips and tutorials.